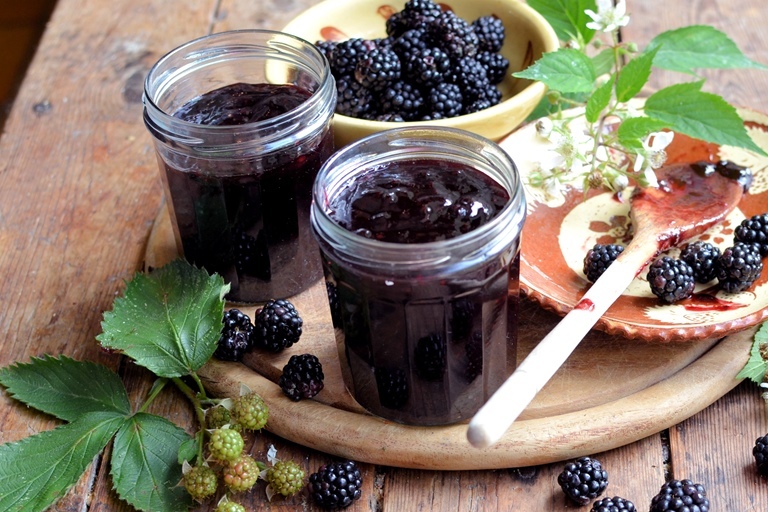 Make the most of beautifully plump blackberries with this stunning blackberry jam recipe by Karen Burns-Booth, including handy tips on testing the setting point of your jam. This recipe makes enough to fill two 300ml jam jars. 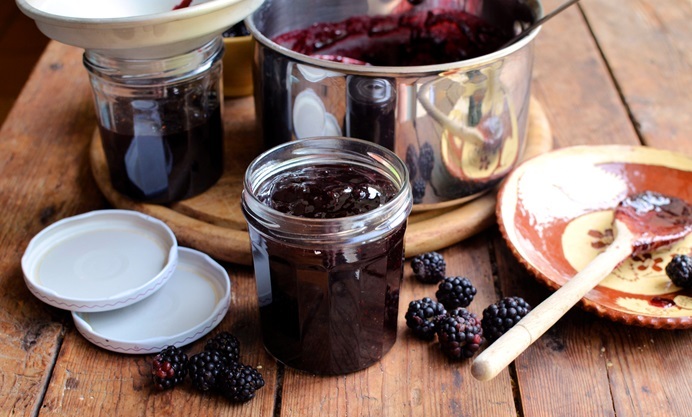 I am an avid jam maker, a person who loves to ‘preserve the seasons’ whether that be summer, winter, spring or autumn, and today’s recipe for Blackberry jam is one of my favourite recipes for blackberries, that plump and aromatic berry that is both a summer and autumn fruit. I remember my mum making jars and jars of this fabulous jam, usually after me and my sister had been ‘brambling’ or ‘blackberrying’ as we used to call it; we would return with bags and bags of these hedgerow berries, and then the hard work would begin, with pies, crumbles and jams being made over the next few days. But, making jam doesn’t have to be hard, and you can make a batch of jam with as little as 450g (1lb) of blackberries. There are a few basic rules to be adhered to before you start – you need to sterilise your jars and make sure you have lids that fit and will make a seal, but other than that, all that is needed is a large pan, a wooden spoon, a funnel and a ladle, and you can jam in the kitchen to your heart’s content! Dip a large spoon into the pan of jam and scoop out a spoonful. Hold the spoon horizontally over the pan of jam and allow the jam to drip – setting point has been reached when the jam forms a long drip, slightly resembling webbed feet, and hangs without dropping from the spoon. Place two or three saucers in the freezer. Once cold, spoon a spoonful of jam onto the cold saucers, and push the jam with your finger. Setting point has been reached when the jam wrinkles and sets.